Goalkeeper Iker Casillas admits he "feels responsible" for Real Madrid's poor La Liga start after being subjected to jeers during Saturday's 2-1 defeat to Atletico Madrid. Real's captain, celebrating 15 years since making his debut, was whistled by some of his own fans as they slipped to a second straight defeat. He said: "If they think they should whistle you have to respect their opinions. "You have to accept some of the blame." Casillas was making his 684th appearance for Real, sitting behind only Raul (741) and Manuel Sanchis (710) in the club records. He has won three Champions Leagues, five league titles, two Intercontinental Cups, two Uefa Super Cups, two Copa del Rey titles and four Spanish Super Cups for Real, as well as the World Cup and two European Championships for Spain. Casillas was beaten by a close-range header from Atletico midfielder Tiago for the opener and some fans felt he could have done more to prevent the goal, although others attempted to drown out the whistles with applause. Despite the departure of Diego Lopez, who was first choice in La Liga last term, the Real captain's place in the team is not assured after the arrival of Costa Rica stopper Keylor Navas. The defeat to Atletico, the first time Real's Madrid rivals have won twice in a row at the Bernabeu, left Carlo Ancelotti's side with three points from three matches and six points adrift of early leaders Barcelona. 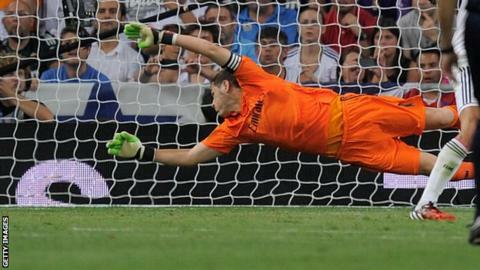 Casillas said: "We have to try to change the dynamic. They are within their rights and all I can do is respond in the way I know how, by playing football. "I can understand this little collective panic we are having because we are letting in a lot of goals from set pieces but I feel responsible as goalkeeper. Between us we have to solve a problem that is getting worse and worse."